The heavy dark lines on the map of ShaoChuanTou below show the position of the modern roads and building lines (the map lies with due North at the top). On the far left (the West) are Hsi-tzu-wan and the Taiwan Straits. Towards the right (the East) is the Ku-shan Fishing Harbour, from where ferries leave to Chi-chin Island to the south. To the north is Ape Hill (Takao Mountain, Shou-shan). The numbers given on the map refer to the highly accurate ROC Land Registry maps. Clearly much land has been reclaimed from the lagoon and sea since the 1850s. 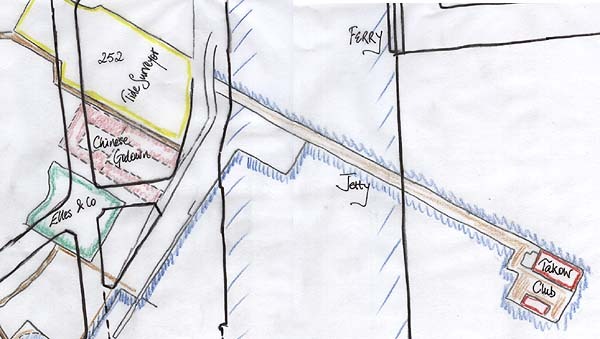 The original hamlet at ShaoChuanTou would have lain in the gully contained within the triangle formed by the 'Old Temple', Plot 468 and Plot 486, in the upper centre of the map. At that time the shoreline was very close to the hills, running from the northern end of the Breakwater almost due east to the path (all paths are marked brown) that turns northwest towards Elles & Co. The Pickering photograph on 'Early Days : 1855 - 1870' gives an idea of the topography. 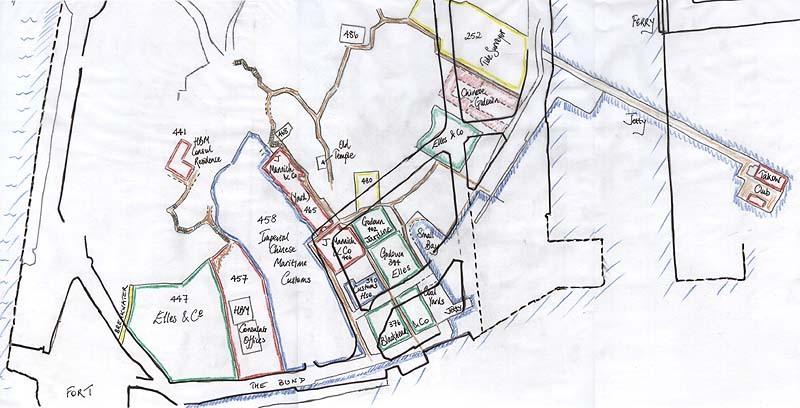 An attempt to unravel the complex foreign ownership of the sites shown is given underneath the map with enhanced sectional maps. Please note that a much enhanced, larger and indeed printable map can be seen be clicking on the link under the graphic. Captain Oliver, representing Dent & Co (甸德洋行), effected the purchase, in January 1860, of all the shoreline from a large rock at the northern end of the then-unbuilt Breakwater to the path beside Mannich & Co and the Old Temple. Before the construction of the harbour moles by the Japanese around 1910, the area of the Breakwater was fully exposed to the pounding waves of the southwest monsoon, so that the sea could wash through to the north of the Fort (bottom left corner). Within a few years, Dent & Co had passed the 'perpetual lease' of the land over to Brown & Co of Amoy. The Amoy company, trading under the Chinese name of Shui-lu ( 水陸洋行 ), proceeded to reclaim land from the lagoon. First they built the breakwater, parts of which still stand today, then they progressively filled in the foreshore until the modern day area was achieved around 1872. In 1878, Brown & Co divested themselves of their holdings in Shao-chuan-tou, effectively dividing it into four pieces. Their erstwhile agent, Julius Mannich, set up his own company of Julius Mannich & Co and retained ownership of the easternmost part of Brown & Co's land (marked as 465 and 406 on the map). 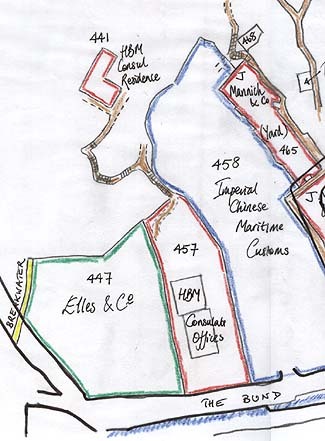 The remaining land was sold in three lots, from West to East, to Elles & Co (447), the British government (457) and the Imperial Chinese Maritime Customs (ICMC) (458). The portion belonging to Elles & Co (怡記洋行) does not seem to have been developed during the late 1870s, and, following that company's financial difficulties, was taken over by creditors such as AW Bain & Co in 1883. 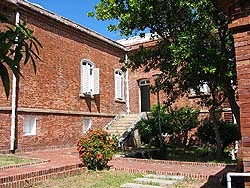 The British government site was developed as the British consular offices, which included a residence for the constable and a gaol for those foreign subjects incarcerated under the extra-territoriality clauses of the 1842 and 1858 treaties. The building exists today (2004) in surprisingly good condition, but less the gaol cells. 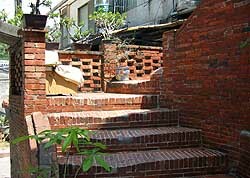 Behind the British Consular Offices are some fine old steps which lead up to the British Consular Residence (441), perched in a superb location, overlooking the Taiwan Straits to the West, the inner harbour or lagoon to the East, and Saracen's Head and Chi-chin Island to the South. Moreover the residence is sheltered by the massive bluff of Ape's Hill from the cold winds of the wintry northeast monsoon. 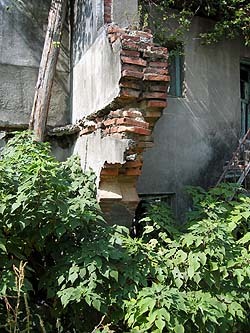 The date of construction of this building is still under investigation. However, most evidence suggests that it was built around 1879 and not in 1866 as usually thought. A page will be added about this later. Central portion of ShaoChuanTou map The central portion of the map, reproduced on the left, shows the area south of the Old Temple, which is more or less contained by the newly built road of An-hai Street (shown in bold black overlay) and the water's edge. 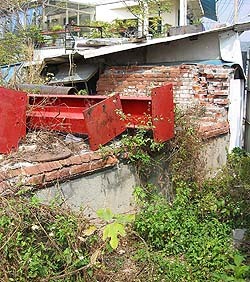 The Old Temple is principally a Land God temple and may well be the oldest temple in Kaohsiung. When the temple was being rebuilt some years ago a small marble tablet was found under the main altar. The stone records an acknowledgement by the Dutch authorities in the 17th century that the temple had land rights dating back to 1551. To the southeast of the Old Temple is Plot 480. 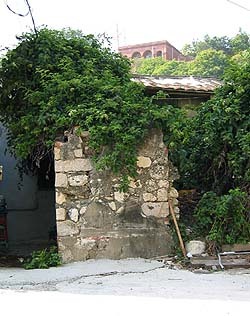 Despite the destruction wrought by the new road, there still remain several walls and the shell of an old building. It is possible that these are the remnants of Captain Rooney's hong on the then northern beach of the lagoon, as Rooney was recorded as investing several thousand dollars in harbour improvements and the construction of a fine warehouse. 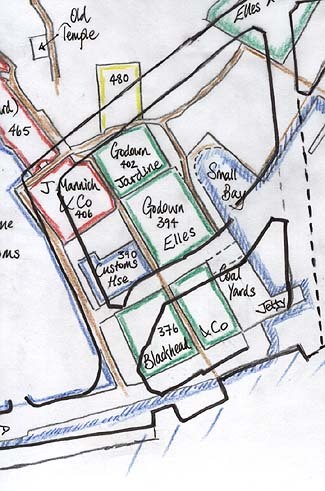 Credence is given to this by the fact that the Jardine warehouse (402) to the south of the path is recorded as having been built on land reclaimed by Captain Sullivan. 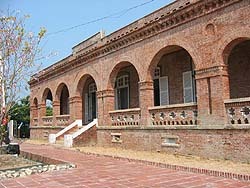 Although the offices (406) of Julius Mannich & Co (東興洋行) have now gone, much of Mannich's warehouse (465) remains and is probably the finest example of a foreign sugar godown in south Taiwan. Mannich's offices were subsequently used by the Japanese postal authorities as the first Takow Post Office. South of J Mannich & Co's site stands the old Customs House (390) dating back to the 1860s. Much of this beautifully built building survives and has splendid steps on the northwest corner. It was apparently used as a hospital during the Japanese rule. To the south of the Customs House once stood the offices and supply depot of Blackhead & Co. However nothing of the building survives today and the site is occupied by an old ice plant. In earlier times this was the Customs wharf and jetty, but with the advent of steamers it was necessary to establish a coal depot and the customs jetty was moved to its present position in front of the old ICMC compound. The eastern portion covers the area that is now the southern end of the Ku-shan Fishing Harbour, from where ferries depart across the lagoon to Chi-chin Island. Four sites are picked out on the map, two of which have completely disappeared. 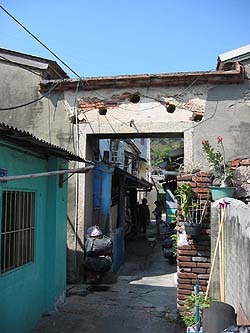 However, traces of the Elles & Co godown and the Bank of Taiwan, which replaced the Tide Surveyor's residence (252), do still remain. The Takow Club, which is perhaps the spiritual father of this Takao Club website, lay at the end of a 150-metre long jetty from which the pilots' boats would leave. According to an 1880 deed under which debenture bonds were issued, the Takow Club building had a Billiard Room, a Bar Room and a Reading Room, with sundry books and pictures. From its position, just south of the Chi-chin Ferry Station, one can still appreciate its position: there are breezes from the lagoon, a view to the British Consulate, and a view to the harbour entrance and across to Chi-hou. It was here that the 'days of beef and beer' could be savoured. 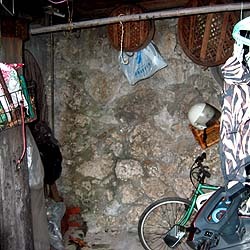 The Chinese Godown has also disappeared. 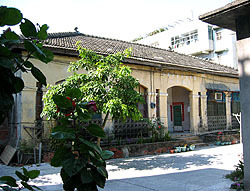 However the fine building with swallow-tail roof indicating that the owner either had mandarin status or was the the actual government, can be seen in several old photographs. 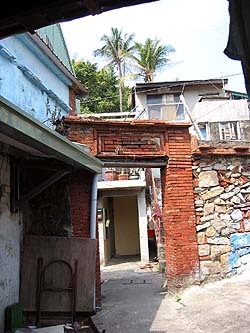 The Tide Surveyor site was leased in 1880 from the Tai-tzu Temple (the original name of the now-relocated San Feng Kung in Ho-pei Road, Kaohsiung) by the ICMC and Elles & Co. 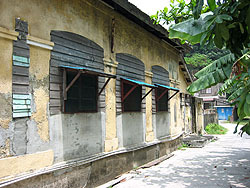 Although no traces remain of the Tide Surveyor's buildings, there is a remaining pediment from the subsequent occupier - the Bank of Taiwan.